This black lacquer secretaire and matching commode by Jean-Henri Riesener (now in the Metropolitan Museum of Art, New York) were the pre-eminent or 'number one' items in the Hamilton Collection and fetched the highest prices (�9,450 each) at the 1882 sale. Both pieces were made for Queen Marie-Antoinette of France in 1783 and reflect her taste for Japanese lacquer. 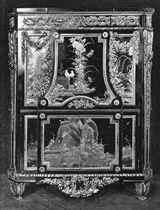 Riesener has cleverly and effectively combined cut-down panels of old Japanese lacquer, from at least three different objects, with extremely rich gilt bronze mounts, incorporating Marie-Antoinette's initials in the friezes. The secretaire and commode were ordered, along with a matching corner cupboard, for the queen's cabinet-int�rieur at Versailles. All three were installed in her private apartments for three years, before being moved briefly to the Trianon. In 1787, the secretaire and commode were sent to Saint-Cloud, the beloved ch�teau that Louis XVI had purchased for his wife two years earlier. They were still in Marie-Antoinette's cabinet-int�rieur - a large corner room, looking out towards Paris - when the French Revolution broke out and the ancien r�gime came crashing down.